No. 4 seed Sam Riffice, who grew up in the Sacramento suburb of Roseville, defeated his doubles partner, No. 7 Brian Cernoch of Rockville, Md., 6-1, 7-6 (3) today in the boys 18 quarterfinals of the Easter Bowl in Indian Wells, Calif.
Riffice will face No. 10 Sebastian Korda, a resident of Bradenton, Fla., who beat Jake Sands of Pacific Palisades in the Los Angeles area 4-6, 6-1, 6-0 in the prestigious hardcourt tournament. Korda's father, Petr, won the 1998 Australian Open to reach No. 2 in the world. Rail thin, he tested positive for doping at Wimbledon that year and was suspended for 12 months but retired shortly before the ban at age 30. Korda's mother, Regina Rajchrtova, climbed to a career-high No. 26 in 1991. His 24-year-old sister, Jessica, won the first of her four LPGA titles in the 2012 Australian Open. Riffice, 18, is 2-0 against Korda, 16, in ITF tournaments, both on hardcourts. In their last meeting, Riffice prevailed 7-6 (3), 7-6 (2) in the quarterfinals of the Coffee Bowl in January in San Juan, Costa Rica. No. 2 seeds Cernoch and Riffice reached the doubles final with a 6-3, 6-3 victory over unseeded Austen Huang and Ryan Seggerman of Coronado in the San Diego region. Cernoch and Riffice will meet No. 3 Oliver Crawford of Spartanburg, S.C., and Patrick Kypson of Raleigh, N.C. In the boys 16 singles semifinals, No. 13 Stefan Dostanic of Irvine, Calif., overwhelmed No. 8 Ryder Jackson of Nicasio, north of San Francisco, 6-1, 6-1. Northern Californians went 1 for 2 on Thursday in Easter Bowl singles finals at Indian Wells, Calif.
Priya Nelson of Sacramento dominated Eleana Yu of Mason, Ohio, 6-1, 6-3 in a matchup of unseeded players in the girls 12s. But No. 2 seed Aryan Chaudhary of Santa Clara lost to No. 9 Alexander Bernard of Naples, Fla., 6-4, 6-2. Chaudhary won the doubles title with Timothy Li of Valley Village, Calif., on Wednesday. Meanwhile, No. 8 Ryder Jackson of Nicasio held off No. 11 Alex Lee of Oak Brook, Ill., 7-5, 7-6 (4) in the boys 16 quarterfinals. Jackson will meet No. 13 Stefan Dostanic, an Irvine resident who outlasted unseeded Jacob Bullard of Calabasas 6-4, 4-6, 6-3. In the boys 18s, No. 4 Sam Riffice from Roseville beat unseeded Trey Hilderbrand of San Antonio 6-2, 6-3. Riffice will play No. 7 Brian Cernoch of Rockville, Md. Unseeded Paul Barretto of Tiburon fell to No. 1 Trent Bryde of Suwanee, Ga., 7-5, 6-2. Unseeded Katie Volynets, 15, of Walnut Creek lost to No. 3 Whitney Osuigwe of Bradenton, Fla., 4-6, 6-3, 6-4. Assuming Collin Altamirano of Sacramento returns for his senior year at two-time defending NCAA champion Virginia in the fall, he will play for a new coach. Brian Boland, who built the Cavaliers into the nation's top men's collegiate program, announced on Wednesday that he will leave after this season to become the USTA head of men's player development. Boland will oversee all training and coaching of male pro, collegiate and junior players by USTA player development and manage all USTA men's national coaches. He replaces Jay Berger, who has served in the position for the last nine years and will remain with the USTA through June. "Brian brings a unique skill set to player development, a combination of management and coaching expertise, which enabled him to build a championships culture at the University of Virginia," said Martin Blackman, the USTA's general manager of player development and a former Stanford star. "He's long been an innovative leader in the world of college tennis and athletics and is the right person at the right time -- a person who can build on the great foundation that has been laid by Jay Berger and our men's coaches and take us to the next level." Boland faces a big challenge. Although the future looks bright for the United States with nine men age 21 or younger in the top 250, no American man has won a Grand Slam singles title since Andy Roddick in 2003. With the retirement of Robby Ginepri in 2015, no active U.S. man has reached a major semifinal. And the United States won the last of its record 32 Davis Cup titles 10 years ago. Boland has amassed a 436-57 (.884) record in 16 seasons at Virginia with three NCAA team titles in the last four seasons. He has been named the ITA National Coach of the Year twice (2008 and 2016) and the Atlantic Coast Conference Coach of the Year 10 times. He has produced three NCAA singles and three doubles champions and 42 All-Americans. Under Boland, Virginia won 140 consecutive ACC matches over a decade. It's the longest streak in conference history in any sport. "For the past 16 years, my family and I have considered it a privilege and a blessing to call Charlottesville our home and the University of Virginia men's tennis program our life," Boland said. "From day one, we believed in the university, and the university believed in us. I will forever be indebted to our athletics director, Craig Littlepage, for taking a chance and granting me the opportunity to lead this program in 2001 at the age of 29. I am also appreciative of every administrator, assistant coach, student-athlete, staff member, donor and fan whose unwavering support and commitment allowed our program to be successful. For this, my family and I will always be truly grateful. "After much consideration and many conversations over a long period of time with my wife Becky, I have decided to resign at the end of this season and accept the role of head of men's tennis for USTA player development at the newly constructed USTA National Campus in Orlando, Florida. I consider this next step in my career to be the absolute highest honor and the ultimate responsibility that can be bestowed upon any tennis coach in the United States. I plan on doing everything in my power, together with the entire USTA and the private sector, to make sure American men's tennis regains its position as the global leader on the ATP Tour, in the Davis Cup and in the Olympics. Lastly, with the recent move of my parents to Florida, where several other of our family members currently reside, this decision gradually developed into the right one for not only my career, but most importantly for my family as well." Altamirano, who won the 2013 USTA national 18-and-under title, has split time with senior Thai-Son Kwiatkowski at No. 1 singles for the Cavaliers this season. Virginia will conduct a national search for Boland's successor. Littlepage has not specified a timetable for filling the position. Two Northern Californians will play for singles titles on Thursday in the prestigious Easter Bowl in Indian Wells. No. 2 seed Aryan Chaudhary of Santa Clara outlasted unseeded Martin Damm Jr. of Bradenton, Fla., 6-3, 3-6, 6-3 today in the boys 14s. Damm's father won the 2006 U.S. Open doubles title with Leander Paes of India and peaked at No. 5 in the world in doubles the following year. Also, unseeded Priya Nelson of Sacramento beat No. 9 Violeta Martinez of Port Saint Lucie, Fla., 6-4, 2-6 [10-2] in the girls 12s. Chaudhary will try to sweep the boys 14 titles when he faces No. 9 Alexander Bernard of Naples, Fla. No. 3 seeds Chaudhary and Timothy Li of Valley Village, Calif., downed unseeded Damm and Aidan Mayo from Roseville 7-5, 6-1 in the doubles final. Bernard knocked off No. 1 Maxwell McKennon of Newport Beach 6-3, 6-1. Nelson will meet unseeded Eleana Yu of Mason, Ohio. Yu surprised No. 1 Matilyn Wang of Scottsdale, Ariz., 6-4, 6-2. Meanwhile, No. 4 Sam Riffice from Roseville and unseeded Paul Barretto of Tiburon won their second-round matches in the boys 18s. Riffice dismissed unseeded Boris Kozlov of Pembroke Pines, Fla., 6-2, 6-1. Kozlov's 19-year-old brother, Stefan, is a professional ranked No. 122 in the world. They were named after Boris Becker and Stefan Edberg. Barretto routed No. 16 Keenan Mayo from Roseville 6-0, 6-3. Barretto will take on No. 1 Trent Bryde of Suwanee, Ga.
Columbia-bound Austen Huang of Elk Grove lost to No. 14 Kyrylo Tsygura of North Potomac, Md., 6-0, 6-3. Katie Volynets, 15, of Walnut Creek topped Grace Joyce of Newton, Mass., 6-1, 7-5 in a second-round matchup of unseeded players in the girls 18s. Volynets will face No. 3 Whitney Osuigwe of Bradenton, Fla.
No. 8 Ryder Jackson of Nicasio reached the boys 16 quarterfinals with a 6-4, 6-3 victory over Pierce Rollins of Tulsa, Okla. No. 16 Marcus McDaniel of Vacaville fell to No. 4 Andrew Dale of Leesburg, Va., 6-1, 6-2. Aryan Chaudhary of Santa Clara and Priya Nelson of Sacramento reached the singles semifinals in their age groups today in the Easter Bowl in Indian Wells, Calif.
Chaudhary, seeded No. 2, defeated No. 7 Alex Lin of Gold River 7-6 (7), 6-4 in the boys 14s. The unseeded Nelson dominated No. 12 Ava Krug of Lakewood Ranch, Fla., 6-3, 6-1 in the girls 12s. Chaudhary will face unseeded Martin Damm Jr. of Bradenton, Fla. Damm, whose father won the 2006 U.S. Open doubles title with Leander Paes of India and peaked at No. 5 in the world in doubles in 2007, downed No. 16 Timothy Li of Valley Village, Calif., 6-3, 6-4. Chaudhary also advanced to the doubles final with Li. Seeded third, they will meet unseeded Damm and Aidan Mayo from Roseville. Nelson will play No. 9 Violeta Martinez of Port Saint Lucie, Fla. Martinez edged No. 15 Alexis Blokhina of Fort Lauderdale, Fla., 6-3, 3-6 [10-8]. No. 8 Ryder Jackson of Nicasio and No. 16 Marcus McDaniel of Vacaville reached the round of 16 in the boys 16s, but Stevie Gould of Corte Madera and Cambell Nakayama of San Francisco lost. Also, Jillian Taggart of Fair Oaks fell to No. 12 Eryn Cayetano of Corona, Calif., 6-4, 6-3 in the girls 16s. Second-round singles matches in the boys and girls 18s are scheduled for Wednesday. Still alive are No. 4 Sam Riffice and No. 16 Keenan Mayo, former Roseville neighbors; Paul Barretto of Tiburon; Austen Huang of Elk Grove; and 15-year-old Katie Volynets of Walnut Creek. In a battle of Sacramento-area players, No. 16 seed Keenan Mayo topped Jenson (J.T.) Brooksby 6-4, 7-6 (1) today in the first round of the Easter Bowl boys 18s in Indian Wells, Calif.
Mayo will play another Northern Californian, Paul Barretto of Tiburon, in the second round. Barretto defeated Ivan Thamma of San Diego 6-3, 6-3. Also advancing were Sacramento-area products Sam Riffice, seeded fourth, and Austen Huang in the boys 18s and 15-year-old Katie Volynets of Walnut Creek in the girls 18s. Falling in the girls 18s were Sara Choy of Palo Alto and Niluka Madurawe of Sunnyvale. Four NorCal boys won in the first round of the 16s: No. 8 seed Ryder Jackson of Nicasio, No. 16 Marcus McDaniel of Vacaville, Stevie Gould of Corte Madera and Cambell Nakayama of San Francisco. Jillian Taggart of Fair Oaks took her opener in the girls 16s. Two NorCal boys, and almost three, advanced to the quarterfinals in the 14s. No. 2 seed Aryan Chaudhary of Santa Clara routed No. 10 Evan Wen of Morristown, N.J., 6-2, 6-0. Chaudhary will meet No. 7 Alex Lin, a Gold River resident who beat Logan Paik Chang of Old Westbury, N.Y., 6-3, 6-2. No. 12 seed Aidan Mayo, Keenan's brother, lost to No. 1 Maxwell McKennon of Newport Beach 6-2, 2-6, 7-6 (4). Meanwhile, Priya Nelson of Sacramento reached the girls 12 quarterfinals. Stanford women's coach Lele Forood posted the 400th victory of her career on Sunday as the No. 5 Cardinal shut out Hawaii 4-0 at the Taube Family Tennis Stadium. Forood, in her 17th season as Stanford's head coach after serving as an assistant and associate head coach for 14 years, improved to 400-38 (.913). Forood has led the Cardinal to eight NCAA team titles and 12 conference crowns, Stanford reported on its website. She has produced five NCAA singles champions and five NCAA doubles winners. Stanford (12-1, 4-0 Pacific-12 Conference) extended its winning streak to eight matches and improved to 9-0 at home. 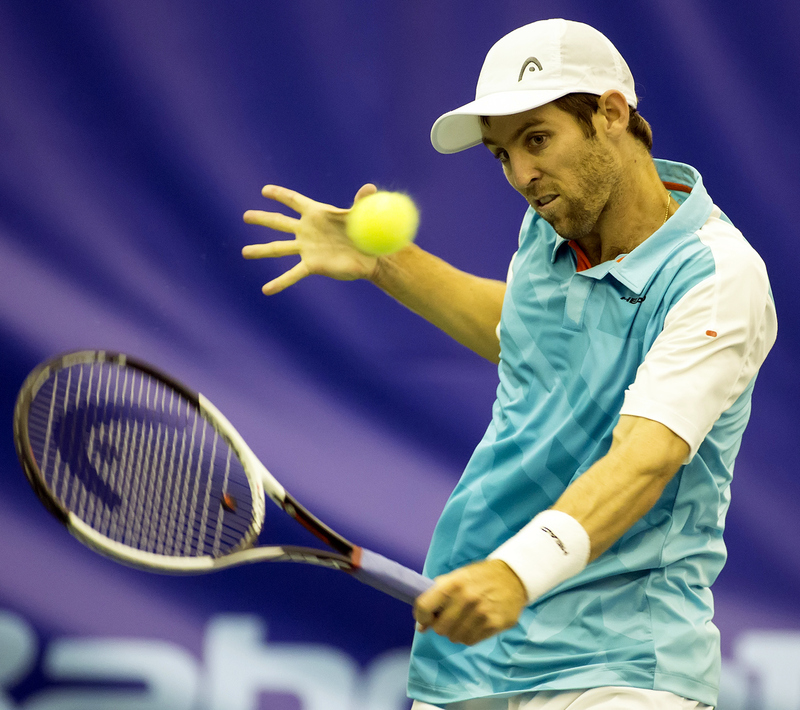 Bradley Klahn volleys in last month's $100,000 KPSF Open in San Francisco. fourth-seeded Sebastian Fanselow of Germany outclassed wild card Bradley Klahn of Poway in the San Diego area 6-3, 6-2 today to win the $25,000 Pro Tennis Championships of Calabasas in the Los Angeles region. Fanselow, a 25-year-old former Pepperdine star, captured his third straight title without losing a set. He won consecutive $15,000 tournaments in Indonesia last month. Klahn, who won the 2010 NCAA singles title as a Stanford sophomore, continued his comeback from back surgery. The left-hander reached a career-high No. 63 in March 2014 but underwent his second operation for a herniated disc in February 2015 and missed almost two years. Fanselow, ranked No. 386, saved the only break point he faced against the 26-year-old Klahn, ranked No. 614. Fanselow defeated qualifier John Lamble from Santa Clara 6-2, 6-0 in the second round and top-seeded Mackenzie McDonald from Piedmont by walkover in the semifinals. Klahn came back to win the doubles title with Connor Smith of Tampa, Fla. The fourth seeds edged second-seeded Farris Fathi Gosea of Great Britain and Alex Lawson of Tempe, Ariz., 6-4, 6-7 (5) [10-5]. Northern Californians went 0 for 3 on Friday and were eliminated from the USTA International Spring Championships in Carson, Calif.
Jenson (J.T.) Brooksby, a 16-year-old wild card from the Sacramento suburb of Carmichael, lost to unseeded Axel Nefve of Boca Raton, Fla., 1-6, 6-2, 6-1 in the boys 18 quarterfinals. No. 8 seed Stefan Leustian of Mather in the Sacramento area fell to No. 6 Andrew Dale of Leesburg, Va., 6-1, 6-2 in the boys 16 semifinals. And No. 5 Leustian and Zachery Lim of Fairfield, between San Francisco and Sacramento, lost to unseeded Hunter Heck of New Brighton, Minn., and Alexander Petrov of Irvine, Calif., by walkover in the boys 16 doubles semis. Brooksby, ranked second nationally in the 16s, reached the 16-and-under final in the USTA National Championships in Kalamazoo, Mich., and the USTA National Clay Court Championships in Delray Beach, Fla., last summer. He won the 12-and-under title in the 2013 USTA National Championships in Little Rock, Ark. Jenson (J.T.) Brooksby, a 16-year-old wild card from Carmichael in the Sacramento area, ousted another seed on Thursday to reach the boys 18 quarterfinals in the USTA International Spring Championships in Carson, Calif.
Brooksby outclassed No. 13 Juan Alejo Hernandez Serrano of Mexico 6-3, 6-1. Brooksby, who stunned No. 4 seed and 2016 runner-up Sam Riffice in the first round, will face unseeded Axel Nefve of Boca Raton, Fla. Nefve beat unseeded Ryan Goetz of Greenlawn, N.Y., 6-2, 6-2. Riffice, who turned 18 on March 1, grew up in the Sacramento suburb of Roseville. Meanwhile, Stefan Leustian of Mather in the Sacramento area advanced to the boys 16 semifinals in singles and doubles. Leustian, seeded No. 8 in singles, defeated No. 14 Andres Martin of Flowery Branch, Ga., 7-5, 6-3. Leustian will play No. 6 Andrew Dale of Leesburg, Va. Dale beat unseeded Stefan Dostanic of Irvine, Calif., 6-4, 6-3. No. 5 Leustian and Zachery Lim of Fairfield, near San Francisco, edged No. 4 Leighton Allen of Austin, Texas, and Dale 5-7, 6-2 [11-9]. Nicole Gibbs, unable to duplicate her success last spring, continued to tumble in the world rankings. The former Stanford star (2011-13), who climbed to a career-high No. 68 last July, plunged 25 more places to No. 119 this week after losing in the first round at Indian Wells to Heather Watson of Great Britain. Gibbs is 0-3 since reaching the third round of the Australian Open in January. Gibbs advanced to the fourth round at Indian Wells as a qualifier last year, upsetting Madison Keys in the second round and losing to two-time Wimbledon champion Petra Kvitova 6-4 in the third set. No. 27 (-1) -- Sam Querrey, 29-year-old San Francisco native. No. 176 (-3) -- Dennis Novikov, 23-year-old resident of Milpitas in San Francisco Bay Area. No. 245 (career high, +12) -- Mackenzie McDonald, 21-year-old product of Piedmont in San Francisco Bay Area. No. 707 (+9) -- Ryan Haviland, 36-year-old former Stanford All-American. No. 763 (no change) -- Bradley Klahn, 26-year-old former NCAA singles champion from Stanford. No. 823 (-23) -- John Lamble, 24-year-old Saratoga resident and former Santa Clara star. No. 814 (+4) -- Collin Altamirano, 21-year-old Sacramento native and resident. No. 876 (-13) -- Connor Farren, 22-year-old product former USC standout from Hillsborough in San Francisco Bay Area. No. 4 (-1) -- Bob Bryan, 38-year-old former NCAA singles and doubles champion from Stanford..
No. 4 (-1) -- Mike Bryan, 38-year-old former NCAA doubles champion from Stanford. No. 61 (-3) -- Scott Lipsky, 35-year-old former Stanford All-American. No. 65 (+14) -- Sam Querrey, 29-year-old San Francisco native. No. 143 (+5) -- Dennis Novikov, 23-year-old resident of Milpitas in San Francisco Bay Area. No. 247 (career high, +5) -- Mackenzie McDonald, 21-year-old product of Piedmont in San Francisco Bay Area. No. 389 (+1) -- John Paul Fruttero, 35-year-old former Cal All-American. No. 620 (-86) -- John Lamble, 24-year-old Saratoga resident and former Santa Clara star. No. 614 (no change) -- Bradley Klahn, 26-year-old former NCAA singles champion from Stanford. No. 55 (career high, no change) -- CiCi Bellis, 17-year-old product of Atherton in San Francisco Bay Area. No. 69 (+1) -- Sloane Stephens, 23-year-old Fresno product. No. 119 (-25) -- Nicole Gibbs, 23-year-old former NCAA singles and doubles champion from Stanford..
No. 203 (+10) -- Kristie Ahn, 24-year-old former Stanford All-American. No. 373 (-2) -- Maria Sanchez, 27-year-old Modesto product. No. 527 (no change) -- Carol Zhao, 21-year-old former Stanford star. No. 725 (-7) -- Michaela Gordon, 17-year-old resident of Saratoga in San Francisco Bay Area. No. 21 (no change) -- Raquel Atawo (formerly Kops-Jones), 34-year-old San Jose resident and 2003 NCAA doubles champion from Cal. No. 61 (-1) -- Maria Sanchez, 27-year-old Modesto product. No. 159 (-4) -- Nicole Gibbs, 23-year-old former NCAA singles and doubles champion from Stanford. No. 330 (+31) -- Kristie Ahn, 24-year-old former Stanford All-American. No. 390 (+3) -- Carol Zhao, 21-year-old former Stanford star. No. 511 (-3) -- CiCi Bellis, 17-year-old product of Atherton in San Francisco Bay Area. No. 601 (-3) -- Maegan Manasse, 21-year-old Cal senior. No. 613 (+113) -- Michaela Gordon, 17-year-old resident of Saratoga in San Francisco Bay Area. No. 711 (-12) -- Felicity Maltby, 19-year-old Sunnyvale resident. No. 733 (-11) -- Alexandra Facey, 24-year-old product of Cameron Park in Sacramento area. No. 733 (-11) -- Kat Facey, 24-year-old product of Cameron Park in Sacramento area. No. 886 (-5) -- Sloane Stephens, 23-year-old Fresno product. Preview, Tennis Channel, 7 a.m.
Women's second round, Tennis Channel, 8 a.m.-8 p.m.
Men's and women's second round, Tennis Channel, 8 a.m.-8:30 p.m.
Miami, preview, Tennis Channel, 7 a.m.
Women's third round, men's second round, Tennis Channel, 8 a.m.-8:30 p.m.
Men's and women's third round, Tennis Channel, 8 a.m.-8:30 p.m.
Women's fourth round, men's third round, Tennis Channel, 8 a.m.-8:30 p.m.
Women's quarterfinals, men's fourth round, Tennis Channel, 8 a.m.-8:30 p.m. Preview, Tennis Channel, 9 a.m.
Men's and women's quarterfinals, ESPN2, 10 a.m.-2 p.m. and 4-8 p.m.
Women's semifinals and men's quarterfinals, ESPN2, 10 a.m.-2 p.m. and 4-8 p.m.
Men's semifinal, ESPN2, 10 a.m.-noon. Men's semifinal, ESPNEWS, 4-6 p.m.
Women's final, ESPN2, 10 a.m.-12:30 p.m.
Men's final, ESPN2, 10 a.m.-12:30 p.m. Through Sunday -- USTA International Spring Championships, Carson, Calif.
March 25-April 2 -- Easter Bowl, Indian Wells. April 1-2, 8-9 -- Gold River Junior Championships, Gold River Racquet Club, Gold River, Calif.
April 7-9 -- Maze Cup (Northern California vs. Southern California juniors), Bakersfield. April 22-23 -- Fed Cup semifinals, Czech Republic at United States, Switzerland at Belarus. April 26-29 -- Pacific-12 Conference Men's and Women's Championships, Ojai, Calif.
April 27-30 -- Big West Conference Men's and Women's Championships, Indian Wells. April 27-29 -- West Coast Conference Men's and Women's Championships, Claremont, Calif.
April 27-30 -- Mountain West Conference Women's Championships, Las Vegas. April 28-30 -- Big Sky Conference Men's and Women's Championships, Phoenix. April 29-30, May 6-7 -- Rio Del Oro Junior Championships, Rio Del Oro Racquet Club, Sacramento. May 12-14 -- NCAA Division I Men's and Women's Team Championships, first and second rounds at campus sites. May 18-29 -- NCAA Division I Men's and Women's Championships, Athens, Ga.
May 28-June 11 -- FRENCH OPEN, Paris. 2015 champions: Novak Djokovic, Garbine Muguruza, Feliciano Lopez/Marc Lopez, Caroline Garcia/Kristina Mladenovic, Martina Hingis/Leander Paes. Roger Federer matched Novak Djokovic with five Indian Wells titles. 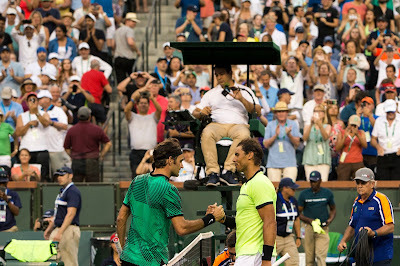 Roger Federer tied Novak Djokovic's record of five Indian Wells titles, and Elena Vesnina earned the biggest singles crown of her career. Federer, seeded No. 9, improved to 20-3 (15-0 on hardcourts) against Swiss countryman Stan Warwinka, seeded No. 3, with a 6-4, 7-5 victory today in the BNP Paribas Open. Earlier, No. 14 Vesnina outlasted No. 8 and fellow Russian Kuznetsova 7-6 (6), 5-7, 6-4 in 3 hours, 1 minute in 95-degree (35.0 Celsius) heat. It was the longest Indian Wells women's final in games (35). 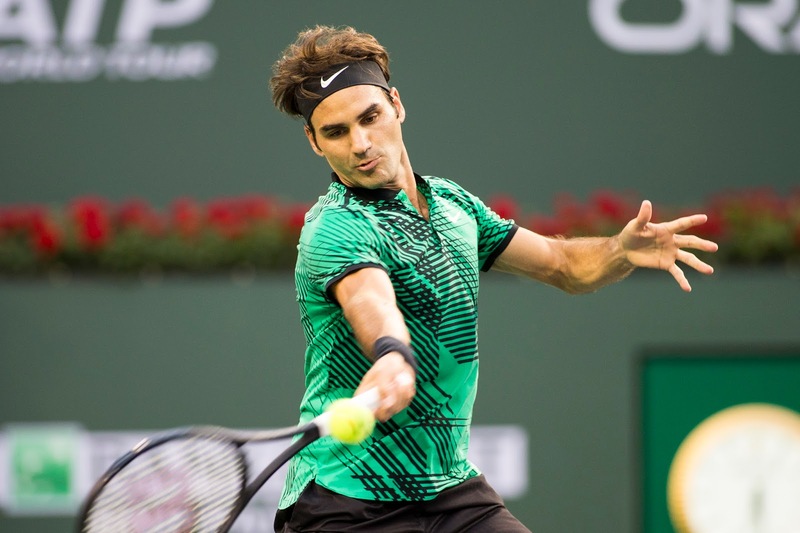 Federer continued his strong comeback after missing last year's BNP Paribas Open with a knee injury. He won the Australian Open, beating Wawrinka in five sets in the semifinals, in January for his ongoing-record 18th Grand Slam singles title. “It’s been just a fairytale week once again,” said Federer, who did not lose a set in the tournament. “I’m still on the comeback. I hope my body is going to allow me to keep on playing. I was very sad when I couldn’t come here last year. At 35, Federer became the oldest champion in a Masters 1000 tournament, the highest level besides the Grand Slams. He surpassed Andre Agassi, who was 34 when he won Cincinnati in 2004. Federer, who will improve four spots to No. 6 in the world on Monday, and Vesnina each earned $1,175,505. Kuznetsova, 31, led 4-1 in second set and 4-2 in third. Although she won the 2004 U.S. Open and 2009 French Open, she has had issues with nerves. "She got tight, and I saw that," Vesnina, 30, admitted in an on-court interview after the first Indian Wells final between women in their 30s. In fact, all four singles finalists are at least 30. Wawrinka is 31. Vesnina, who lost in the first round of qualifying last year at Indian Wells, will rise two notches to a career-high No. 13. In women's doubles, Vesnina owns two Grand Slam titles (2013 French Open and 2014 U.S. Open with compatriot Ekaterina Makarova) and three Indian Wells crowns (2008, 2011 and 2013 with three different partners). Switzerland was not going to be outdone by Russia. 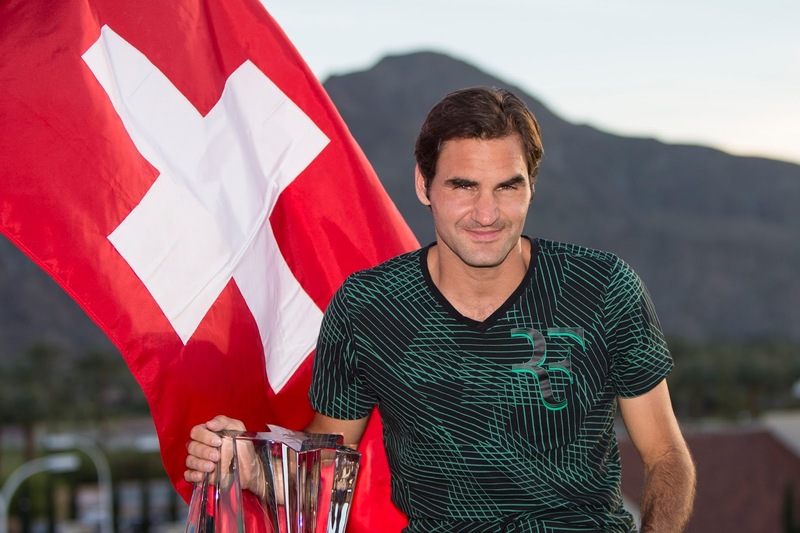 One day after Svetlana Kuznetsova and Elena Vesnina set up an all-Russia women's final in the BNP Paribas Open, Swiss stars Roger Federer and Stan Wawrinka today advanced to the men's final at Indian Wells. No. 9 seed Federer defeated No. 17 Jack Sock of Kansas City, Kan., 6-1, 7-6 (4), and No. 3 Wawrinka outclassed No. 21 Pablo Carreno Busta of Spain 6-3, 6-3. Both Federer, 35, and Wawrinka, 31, improved to 3-0 against their opponents. Federer has not lost a set in three matches against Sock, 24. Warwrinka has lost one (on clay) against Carreno Busta, 25. For good measure, No. 6 seeds Martina Hingis of Switzerland and Chan Yung-Jan of Taiwan won the women's doubles title with a 7-6 (4), 6-2 victory over unseeded Czechs Lucie Hradecka and Katerina Siniakova. All was not lost for the United States as No. 6 seeds Rajeev Ram of Carmel, Ind., and Raven Klaasen of South Africa edged No. 8 Lukasz Kubot of Poland and Marcelo Melo of Brazil 6-7 (1), 6-4 [10-8] for the men's doubles crown. Federer seeks a record-tying fifth Indian Wells title but first since 2012. Wawrinka will play in his first Indian Wells final. Federer is 19-3 against Wawrinka with a three-match winning streak. Federer holds a 14-0 advantage on hardcourts, including a five-set victory in the Australian Open semifinals in January en route to the title. Kuznetsova, 31, and Vesnina, 30, have split two career meetings. Kuznetsova triumphed on clay in the Estoril (Portugal) semifinals in 2014, and Vesnina won on hardcourt in the second round at Dubai in 2009. Kuznetsova, a two-time Grand Slam champion, seeks her first Indian Wells title in her third final. Vesnina advanced to the BNP final for the first time. ESPN will televise the women's final on Sunday at 11 a.m. and the following men's final. Roger Federer emerged from the "Quarter of Death" anticlimactically. Nick Kyrgios, who toppled Novak Djokovic for the second consecutive tournament in the round of 16, withdrew from his quarterfinal showdown against Federer today with a stomach illness. "Unfortunately, I am unable to play today due to sickness," Kyrgios, a 21-year-old Australian, said in a statement. "At this stage, we think it's food poisoning, and I'm praying it's nothing more. After a restless night of being sick, I have nothing left, and to play a great champion like Roger, I need to be at my best to have a chance. I don't take this decision lightly. These are the matches we train for, but I'm in no fit state to take the court. "I'm sorry to the fans that I'm unable to take to the court, but I have to put my health first, and I hope you understand. I want to wish Roger the best of luck for the rest of the tournament and thank everyone for their support so far here at the BNP Paribas Open. I will definitely be back. Thank you." Meanwhile, No. 8 seed Svetlana Kuznetsova and No. 14 Elena Vesnina will meet in an all-Russian final on Sunday at 11 a.m. (ESPN). Two weeks ago in Acapulco, Kyrgios joined countryman Lleyton Hewitt as the only players to win their first match against Djokovic, Federer and Rafael Nadal. In his only match against Federer, Kyrgios won 6-7 (2), 7-6 (5), 7-6 (12) in the second round at Madrid on clay in 2015. Kyrgios reached the semifinals of the 2013 Sacramento Challenger at 18. The No. 9-seeded Federer, a four-time champion at Indian Wells who defeated Nadal in the round of 16, will play No. 17 Jack Sock, who reached his first Masters 1000 semifinal, on Saturday at about 1 p.m. (ESPN). Sock, the top-ranked American at No. 18, beat Kei Nishikori, seeded fourth and ranked fifth, 6-3, 2-6, 6-2 for his first victory over a top-five player. Sock, who received a first-round bye, has won all four of his matches in three sets. He saved four match points against No. 12 seed Grigor Dimitrov in the third round and came within two points of losing to unseeded Malek Jaziri in the round of 16. Sock, the 2015 BNP doubles champion with Vasek Pospisil, has not won a set in two matches against Federer. Both matches occurred in 2015. Federer won 6-3, 6-2 in the round of 16 at Indian Wells and 6-3, 6-4 indoors in the semifinals at Basel, Federer's hometown. Sock won his first Challenger singles title in Tiburon in 2012 at 20, edging Mischa Zverev 7-6 in the third set of the final. Zverev shocked top-ranked Andy Murray before losing to eventual champion Federer in the quarterfinals of the Australian Open in January. An all-Swiss final on Sunday is likely. No. 3 seed Stan Wawrinka will face No. 21 Pablo Carreno Busta of Spain in Saturday's first semifinal at 11 a.m. (ESPN). Wawrinka is 2-0 against Carreno Busta, also playing in his first Masters 1000 semifinal, but both matches were on clay. The resurgent Kuznetsova, 31, defeated No. 3 Karolina Pliskova of the Czech Republic 7-6 (5), 7-6 (2) to reach her third Indian Wells final. She lost to Daniela Hantuchova in 2007 and Ana Ivanovic in 2008. Kuznetsova, a two-time Grand Slam champion (2004 U.S. Open and 2009 French Open), then failed to advance past the third round in eight consecutive BNP appearances until this year. Pliskova already has won two titles this year (Brisbane and Doha). She lost to Angelique Kerber in the final of last year's U.S. Open, after stunning Serena Williams in the semifinals, and the 2015 Bank of the West Classic at Stanford. Vesnina, 30, gained her first singles final in a WTA Premier Mandatory tournament with a 6-3, 6-4 victory over No. 28 Kristina Mladenovic of France. Vesnina reached the Wimbledon semifinals last year and upset No. 2 seed Kerber in the round of 16 of the BNP Paribas Open. Mladenovic, 23, beat two former Indian Wells champions in the tournament: Simona Halep (2015) in the third round and Caroline Wozniacki (2011) in the quarterfinals. Pablo Carreno Busta (21), Spain, def. Pablo Cuevas (27), Uruguay, 6-1, 3-6, 7-6 (4). Stan Wawrinka (3), Switzerland, def. Dominic Thiem (8), Austria, 6-4, 4-6, 7-6 (2). Raven Klaasen, South Africa, and Rajeev Ram (6), United States, def. Gilles Muller, Luxembourg, and Sam Querrey, United States, 6-2, 6-4. Kristina Mladenovic (28), France, def. Caroline Wozniacki (13), Denmark, 3-6, 7-6 (4), 6-2. Elena Vesnina (14), Russia, def. Venus Williams (12), United States, 6-2, 4-6, 6-3. Yung-Jan Chan, Taiwan, and Martina Hingis (6), Switzerland, def. Bethanie Mattek-Sands, United States, and Lucie Safarova (1), Czech Republic, 7-6 (7), 7-5. Lucie Hradecka and Katerina Siniakova, Czech Republic, def. Ekaterina Makarova and Elena Vesnina (2), Russia, 6-3, 6-3. Roger Federer (9), Switzerland, vs. Nick Kyrgios (15), Australia (quarterfinal, ESPN). Kei Nishikori (4), Japan, vs. Jack Sock (17), United States (quarterfinal, Tennis Channel). Jamie Murray, Great Britain, and Bruno Soares (4), Brazil, vs. Lukasz Kubot, Poland, and Marcelo Melo (8), Brazil (semifinal, Tennis Channel). Elena Vesnina (14), Russia, vs. Kristina Mladenovic (28), France (semifinal, ESPN2). Karolina Pliskova (3), Czech Republic, vs. Svetlana Kuznetsova (8), Russia (semifinal, ESPN2). match in the BNP Paribas Open at Indian Wells. Federer won 6-2, 6-3. 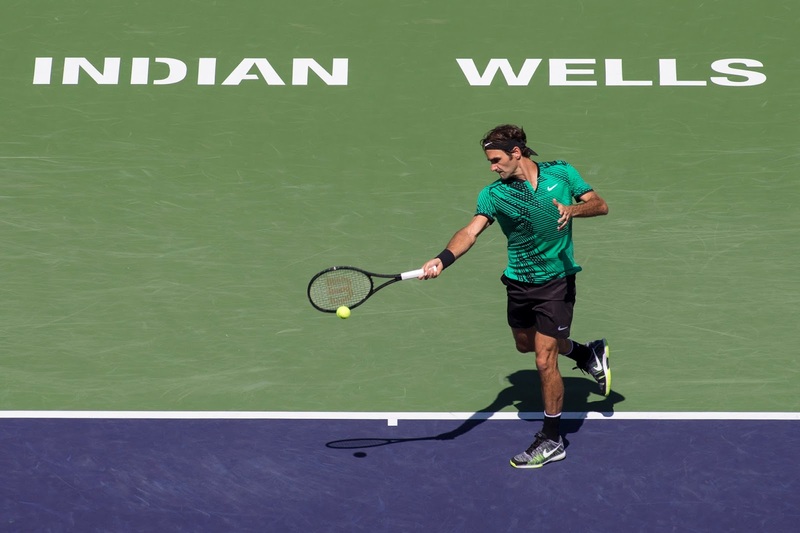 INDIAN WELLS -- Roger Federer continues to defy time. Nick Kyrgios' time is rapidly approaching. 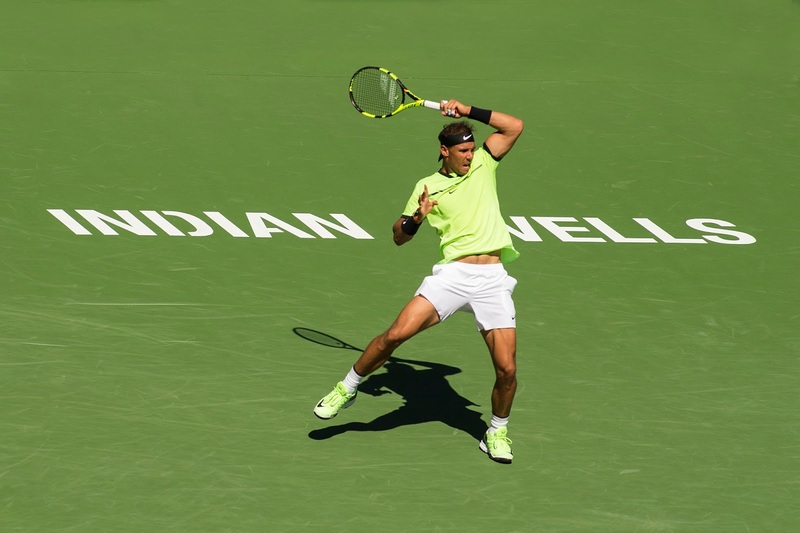 In consecutive fourth-round matches at 16,100-seat Stadium 1 on Wednesday, Kyrgios ended Novak Djokovic's BNP Paribas Open winning streak at 20 matches and Federer outclassed Rafael Nadal in the "Quarter of Death." Both Federer and Kyrgios backed up earlier victories over their opponents this year. Federer, seeded ninth and ranked 10th, needed only 68 minutes to defeat Nadal, seeded fifth and ranked sixth, by the surprisingly one-sided score of 6-2, 6-3. It was the earliest Federer, 35, and Nadal, 30, have met in a tournament since their first encounter in 2004 and Federer's most one-sided victory against his archrival since winning 6-3, 6-0 in the round-robin phase of the 2011 ATP World Tour Finals in London. Federer also earned his third consecutive victory over Nadal for the first time following wins in the finals at Basel, Federer's hometown, in 2015 and in the Australian Open in January. The Melbourne title was Federer's first since Wimbledon in 2012. He missed the last six months of 2016 after hurting his left knee while giving his twin daughters a bath and undergoing arthroscopic surgery. "It's a nice feeling to win the last three (over Nadal), I can tell you that," said Federer, who trails 23-13 in the head-to-head series. "But most importantly, I won Australia. That was big for me. On the comeback, I look back at that and think that was one of the coolest things I ever experienced in my career. "Basel was special, too, for many reasons, because I used to be a ballboy there. After the Australian hype, to play here in America right away, all of them are very special. All the matches that we have played are unique in many ways for both of us, winning or losing. So I take it. Obviously, I can't celebrate too long this time around. I have to get back to work in a couple of days." Federer broke Nadal's serve in the first game of the match and dominated the rest of the way. As in Melbourne, Federer crushed his much-improved one-handed backhand. "In Australia, it was a very close match," Nadal said. "I had good chances to win. Today, not. Today he played better than me. ... These kind of matches, when you're not playing your match, it is impossible to win." Federer, a four-time champion at Indian Wells, will face Kyrgios, 21, for the second time on Friday in the quarterfinals. Kyrgios prevailed 6-7 (2), 7-6 (5), 7-6 (12) in the second round at Madrid on clay in 2015. The hard-serving but mercurial Kyrgios, seeded 15th and ranked 16th, improved to 2-0 against Djokovic, seeded and ranked second, with a 6-4, 7-6 (3) victory. Kyrgios reached the semifinals of the 2013 Sacramento Challenger at 18. When Kyrgios beat Djokovic 7-6 (9), 7-5 in the quarterfinals at Acapulco, the tournament before Indian Wells, he joined countryman Lleyton Hewitt as the only players to win their first matches against Djokovic, Federer and Nadal. "I'm very impressed with him taking out Novak in back-to-back weeks on Novak's best surface," Federer said. "I hope it's going to lead to something great for Nick, that he realizes if he puts his head down and focuses that he can bring it, day in and day out, week in and week out. "When it matters the most against the best and in finals, he's there. ... Of course, I'd like to get him back." Djokovic has won Indian Wells five times, including the last three years. "The run was amazing," he said, "I am very proud of it, obviously. It had to end at some stage. Unfortunately, it was today. Nick, as he did in Acapulco, served so well. I just wasn't managing to get a lot of balls back on his serve, first and second. That's what made a difference." In the second-set tiebreaker, Kyrgios hit a 126-mph (202.8-kph) second-serve ace. "He obviously comes out playing his style, very aggressive, and just going for every serve, whether it's first or second," Djokovic said. "It's obviously very hard to play like that." Since opening the season with the Doha title (saving five match points against Fernando Verdasco in the semifinals), Djokovic has failed to reach the semifinals in his three tournaments. The six-time Australian Open champion lost to Denis Istomin in the second round at Melbourne. Another former Australian Open champion, Stan Wawrinka, almost joined Djokovic on the sideline on Wednesday. 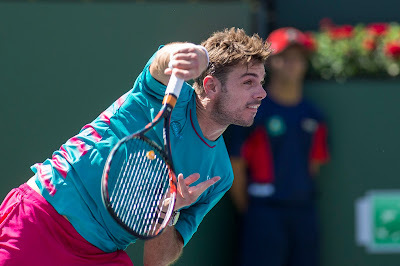 The third-seeded Wawrinka edged lucky loser Yoshihito Nishioka, 21, of Japan 3-6, 6-3, 7-6 (4). Wawrinka will meet No. 8 seed Dominic Thiem, who dispatched No. 10 Gael Monfils 6-3, 6-2. Japan will, however, have a player in the quarterfinals. No. 4 seed Kei Nishikori reached that stage for the second straight year, eliminating Donald Young of Atlanta 6-2, 6-4. Nishikori will face No. 17 seed Jack Sock. The top-ranked American at No. 18, Sock beat Malek Jaziri of Tunisia 4-6, 7-6 (1), 7-5. No. 27 seed Pablo Cuevas, coming off his third consecutive Sao Paulo title on clay, surprised No. 11 and 2016 semifinalist David Goffin of Belgium 6-3, 3-6, 6-3. Cuevas, from Uruguay, will play another Pablo, No. 21 Carreno Busta of Spain. On the women's side, No. 3 seed Karolina Pliskova reached the semifinals for the second straight year. The 25-year-old Czech topped No. 7 Garbine Muguruza of Spain 7-6 (2), 7-6 (5). Pliskova will take on No. 8 Svetlana Kuznetsova, who defeated No. 19 Anastasia Pavlyuchenkova 6-3, 6-2 in an all-Russian encounter. The semifinal matchups in the bottom half of the draw will be determined today. Sam Querrey, a 29-year-old San Francisco native, and Gilles Muller, a 33-year-old left-hander from Luxembourg, edged No. 3 seeds and reigning Australian Open champions Henri Kontinen of Finland and John Peers of Australia 6-7 (2), 6-3 [10-6] in the quarterfinals. 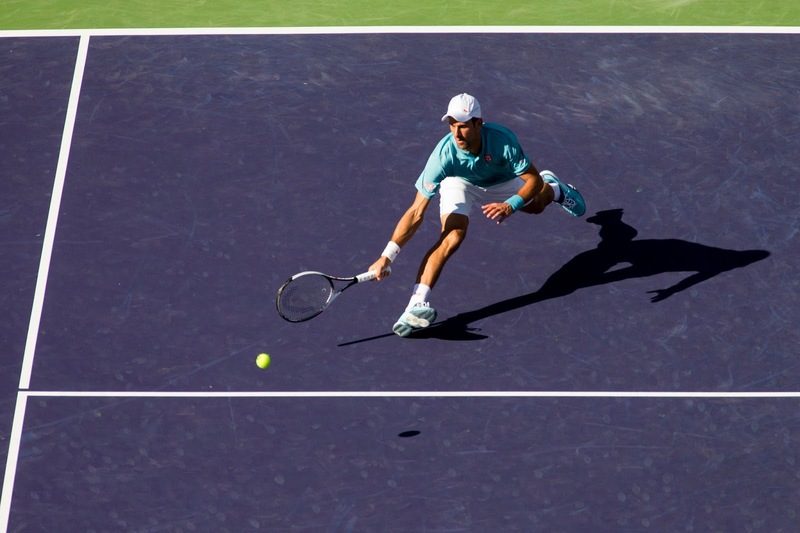 of the BNP Paribas Open with straight-set victories on Tuesday. INDIAN WELLS -- Some things just aren't supposed to happen. People with no political or military experience aren't supposed to be elected president. The wrong movie isn't supposed to be announced as the Oscar winner. And Roger Federer and Rafael Nadal aren't supposed to meet in the fourth round of a tournament. But strange things do occur. And so it is at the BNP Paribas Open. 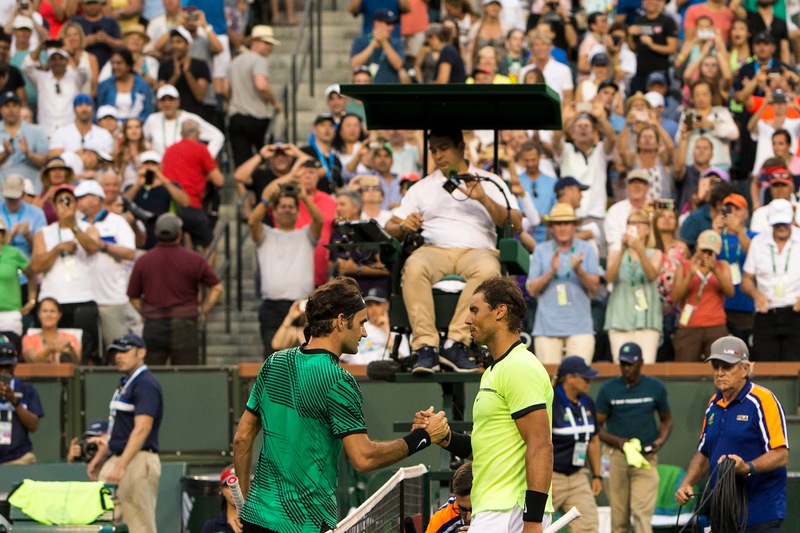 Federer and Nadal, arguably the two greatest players in history, will face each other in the round of 16 today not before 5 p.m. in front of a likely sellout crowd in 16,100-seat Stadium 1. Tennis Channel will televise the showdown live. "It's a tough draw, but rankings are not the priority for both of us," Federer, seeded No. 9, said after holding off No. 24 Steve Johnson of Redondo Beach in the Los Angeles area 7-6 (3), 7-6 (4) on Tuesday. "From that standpoint, if it happens fourth round or finals ... finals would be good. But anything else but a finals, it almost doesn't matter which round it would be." No. 5 seed Nadal beat fellow Spaniard Fernando Verdasco, the No. 26 seed, 6-3, 7-5. Also in the "quarter of death," No. 2 Novak Djokovic will face No. 15 Nick Kyrgios. Djokovic downed No. 31 Juan Martin del Potro, who used his percussive forehand to topple Federer for the 2009 U.S. Open title, 7-5, 4-6, 6-1. Kyrgios, who upset Djokovic in the Acapulco quarterfinals the week before Indian Wells, dismissed No. 18 Alexander Zverev 6-3, 6-4 in a matchup of rising stars. Djokovic has won five Indian Wells titles, including the last three. Federer has captured four and Nadal three. Nadal, Federer and del Potro have dropped in the rankings because of injuries. They are No. 6, No. 10 and No. 35, respectively. "Is probably not the best thing to have (big) matches that early in the tournament," Nadal said. "For the players, is not good because good players, for sure, going to go out early." Less than two months ago, Federer beat Nadal in five sets in the Australian Open final -- that's more like it -- for his ongoing-record 18th Grand Slam singles title. Nadal and Pete Sampras are tied for second with 14. Federer, 35, hadn't won a major since Wimbledon in 2012, and Nadal, 30, hasn't taken one since the 2014 French Open. This match will be much different than the Australian Open final, Federer said, not only because of the round but the conditions and format. "It will feel different," Federer conceded. "It's going to be more difficult for both of us just to rip winners into the corner. That's normal. If you play early matches, you usually see the top guys not chase the lines so much. You give yourself some margins for error. "So I think this match will be played a bit different. This is a hardcourt, I know, but it plays very different to Australia. We have different balls, different grit of court. Because it's early in the tournament, I think we don't quite yet know 100 percent how everything feels. "So there is a bit of the unknown, which is exciting maybe for the fans or you guys to see how we're going to figure that part out. And then, it's a best-of-three-set match. This is more of a sprint than a marathon like in Australia." Nadal leads Federer 23-12 in their head-to-head series. This will be their earliest meeting in a tournament since their first one. Nadal, then 17, upset Federer, who already was ranked No. 1, 6-3, 6-3 in the third round at Miami in 2004. "I don't remember very well," Nadal said with a smile. "It was a long time ago. I went on court, nothing to lose. A lot of motivation to play against, I think, No. 1 already. "This is not like now. I want to win, and I want to be in the final round, and I want to fight for the tournament. In that moment, I was 17. And for me to play with Roger, doesn't matter if it was in that early round. I didn't feel it was unlucky for me. It was a beautiful match, and I tried to go out on court and enjoy it and fight for it." On the women's side Tuesday, Angelique Kerber's struggles in the BNP Paribas Open continued, as the No. 2 seed lost to No. 14 Elena Vesnina 6-3, 6-3 in the round of 16. Kerber, the champion of the 2015 Bank of the West Classic at Stanford, had not won a match in three appearances at Indian Wells since reaching the semifinals for the second consecutive year in 2013. Nevertheless, Kerber will regain the No. 1 ranking on Monday because Serena Williams, last year's runner-up at Indian Wells, pulled out before the tournament with a knee injury. Vesnina, who will face No. 12 seed Venus Williams, is one of three Russian women in the quarterfinals. The other two, No. 8 Svetlana Kuznetsova and No. 19 Anastasia Pavlyuchenkova, will play each other. The other quarterfinal matchups are No. 3 Karolina Pliskova vs. No. 7 Garbine Muguruza and No. 13 Caroline Wozniacki vs. No. 28 Kristina Mladenovic. doubles partner Donald Young in the second round at Indian Wells. Sam Querrey, playing his first singles match since upsetting Rafael Nadal to win the Mexican Open in Acapulco on March 4, lost to fellow American and part-time doubles partner Donald Young 6-3, 3-6, 6-3 on Sunday in the second round of the BNP Paribas Open at Indian Wells. The 6-foot-6 (1.98-meter) Querrey, seeded 23rd, received a first-round bye. The 29-year-old San Francisco native ousted four top-20 players in succession in Acapulco: No. 11 David Goffin of Belgium, No. 9 and defending champion Dominic Thiem of Austria, No. 17 Nick Kyrgios of Australia and No. 6 Nadal. Querrey and Young shocked defending champions Jamie Murray and Bruno Soares in the first round of the Australian Open in January en route to the round of 16. Querrey is playing with Gilles Muller of Luxembourg in the BNP Paribas Open; Young is not playing doubles at Indian Wells. Young, who stunned Andy Murray in the second round at Indian Wells in 2011 as a qualifier, continued his strong play this year. The 27-year-old left-hander reached the semifinals in Memphis and Delray Beach in consecutive weeks last month. Facing tall players doesn't seem to bother the 6-foot (1.83-meter) Young. He also defeated 6-foot-11 (2.11-meter) Reilly Opelka and 6-foot-10 (2.08-meter) John Isner back to back indoors in Memphis and 6-foot-11 Ivo Karlovic in the first round outdoors in Delray Beach. Young will face 14th-seeded Lucas Pouille of France. Pouille, 23, reached the quarterfinals at Wimbledon and the U.S. Open last year, stunning Nadal in the round of 16 at Flushing Meadows. Taylor Fritz, a 19-year-old wild card from Southern California, shocked Marin Cilic, seeded sixth and ranked seventh, 4-6, 7-5, 6-4 at Indian Wells for his first victory over a top-10 player. Fritz, who won the 2015 Sacramento Challenger at 17 for his first pro title, will play unseeded Malek Jaziri of Tunisia. Jaziri, 33, surprised 32nd-seeded Marcel Granollers of Spain 7-5, 6-3. Nick Kyrgios and Nenad Zimonjic upset former Stanford stars Bob and Mike Bryan, the No. 2 seeds and two-time champions, 6-4, 3-6 [10-7] in the first round on Saturday. Zimonjic, a 40-year-old Serb, has won 54 tour-level doubles titles. He and Daniel Nestor advanced to the Indian Wells final twice, losing to Israelis Jonathan Erlich and Andy Ram in 2008 and Spaniards Marc Lopez and Nadal in 2010.
month's KPSF Open in San Francisco. Vasek Pospisil, who reached the final of a minor-league tournament in San Francisco one month ago, stunned top-ranked Andy Murray 6-4, 7-6 (5) on Saturday in the second round of the BNP Paribas Open at Indian Wells. Pospisil, a 26-year-old qualifier from Canada, has plunged from a career-high No. 25 in 2014 to No. 129. He hired International Tennis Hall of Famer Mark Woodforde as his coach at the end of last season. 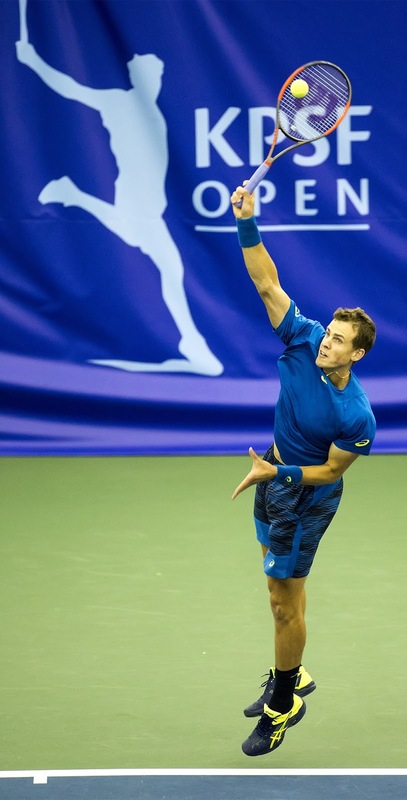 "I feel like I'm on a comeback trail," Pospisil, who lost to qualifier Ze Zhang of China in the final of last month's $100,000 KPSF Challenger in San Francisco said on bnpparibasopen.com. "I had a tough year last year for many, many different reasons. I feel the last couple months I really found my hunger and my motivation to be back on the court training hard again. "I felt like a big result was coming, because I believe in my abilities, but just kind of had to put the pieces together again. Obviously to beat the No. 1 player in the world is incredible. It's the biggest win of my career, and I'm just thrilled right now." Pospisil reached the third round at Indian Wells for the first time in five appearances. However, he won the 2015 doubles title with American Jack Sock one year after they took the Wimbledon crown. Pospisil will face qualifier Dusan Lajovic of Serbia in the third round on Monday. Lajovic surprised 30th-seeded Feliciano Lopez, a 2015 quarterfinalist from Spain, 6-2, 4-6, 7-6 (2). Murray, who received a first-round bye, played his first singles match since winning the Dubai title on March 4. The 29-year-old Scotsman has had mixed results at Indian Wells. He advanced to the final in 2009, semifinals in 2015 and quarterfinals in 2010 and 2013. But this was the third time in seven years that Murray has lost his opening match in the tournament. He fell in the second round to Donald Young in 2011 and Guillermo Garcia-Lopez in 2012. Murray also lost to Federico Delbonis, 7-6 in the third set, in the third round last year. No. 26 in the world on Monday after winning last week's Mexican Open in Acapulco. It's Querrey's highest ranking since he also was No. 26 in 2013. The 29-year-old San Francisco native reached a career-high No. 17 in 2011. The unseeded Querrey knocked off four top-20 players in succession to become the first U.S. man to win Acapulco in the 24-year history of the tournament. He ousted, in order, No. 11 David Goffin, No. 9 Dominic Thiem, No. 17 Nick Kyrgios and No. 6 Rafael Nadal. Thiem was the defending champion, Kyrgios had upset Novak Djokovic in the quarterfinals, and Nadal won Acapulco twice (2005 and 2013) when the tournament was played on clay. Querrey, seeded 23rd in the BNP Paribas Open at Indian Wells, will play the winner of today's first-round match between Americans Donald Young and Stefan Kozlov. All men's and women's seeds received opening-round byes. Querrey reached the round of 16 at Indian Wells in 2011 and 2013 for his best results in the tournament. No. 26 (+14) -- Sam Querrey, 29-year-old San Francisco native. No. 173 (-2) -- Dennis Novikov, 23-year-old resident of Milpitas in San Francisco Bay Area. No. 257 (-3) -- Mackenzie McDonald, 21-year-old product of Piedmont in San Francisco Bay Area. No. 716 (+2) -- Ryan Haviland, 36-year-old former Stanford All-American. No. 763 (-1) -- Bradley Klahn, 26-year-old former NCAA singles champion from Stanford. No. 800 (no change) -- John Lamble, 24-year-old Saratoga resident and former Santa Clara star. No. 818 (-4) -- Collin Altamirano, 21-year-old Sacramento native and resident. No. 863 (-3) -- Connor Farren, 22-year-old product former USC standout from Hillsborough in San Francisco Bay Area. No. 3 (no change) -- Bob Bryan, 38-year-old former NCAA singles and doubles champion from Stanford..
No. 3 (no change) -- Mike Bryan, 38-year-old former NCAA doubles champion from Stanford. No. 58 (+3) -- Scott Lipsky, 35-year-old former Stanford All-American. No. 79 (+6) -- Sam Querrey, 29-year-old San Francisco native. No. 148 (-8) -- Dennis Novikov, 23-year-old resident of Milpitas in San Francisco Bay Area. No. 252 (-3) -- Mackenzie McDonald, 21-year-old product of Piedmont in San Francisco Bay Area. No. 390 (-4) -- John Paul Fruttero, 35-year-old former Cal All-American. No. 534 (no change) -- John Lamble, 24-year-old Saratoga resident and former Santa Clara star. No. 614 (-1) -- Bradley Klahn, 26-year-old former NCAA singles champion from Stanford. No. 55 (career high, +1) -- CiCi Bellis, 17-year-old product of Atherton in San Francisco Bay Area. No. 70 (-2) -- Sloane Stephens, 23-year-old Fresno product. No. 94 (-10) -- Nicole Gibbs, 23-year-old former NCAA singles and doubles champion from Stanford..
No. 213 (+4) -- Kristie Ahn, 24-year-old former Stanford All-American. No. 371 (+28) -- Maria Sanchez, 27-year-old Modesto product. No. 527 (+1) -- Carol Zhao, 21-year-old former Stanford star. No. 718 (-6) -- Michaela Gordon, 17-year-old resident of Saratoga in San Francisco Bay Area. No. 60 (-2) -- Maria Sanchez, 27-year-old Modesto product. No. 155 (-1) -- Nicole Gibbs, 23-year-old former NCAA singles and doubles champion from Stanford. No. 361 (-1) -- Kristie Ahn, 24-year-old former Stanford All-American. No. 393 (-63) -- Carol Zhao, 21-year-old former Stanford star. No. 508 (-62) -- CiCi Bellis, 17-year-old product of Atherton in San Francisco Bay Area. No. 598 (+2) -- Maegan Manasse, 21-year-old Cal senior. No. 699 (+2) -- Felicity Maltby, 19-year-old Sunnyvale resident. No. 722 (-2) -- Alexandra Facey, 24-year-old product of Cameron Park in Sacramento area. No. 722 (-2) -- Kat Facey, 24-year-old product of Cameron Park in Sacramento area. No. 881 (+2) -- Sloane Stephens, 23-year-old Fresno product.